The first intervention by Professor Jasbir K. Puar (Women's & Gender Studies at Rutgers University), is entitled The Right to Maim: Debility, Capacity, Disability discusses her recent book on bio politics and disability in the context of American exceptionalism, the war on terror, and Gaza. The second intervention by Dr. Rami Salameh (the Department of Philosophy and Cultural Studies) is entitled Corporeal Experiences: Living as Colonised, discusses the body as a site of power practices and strategies, or bodies as a site of resistance and counter-hegemonic practices. 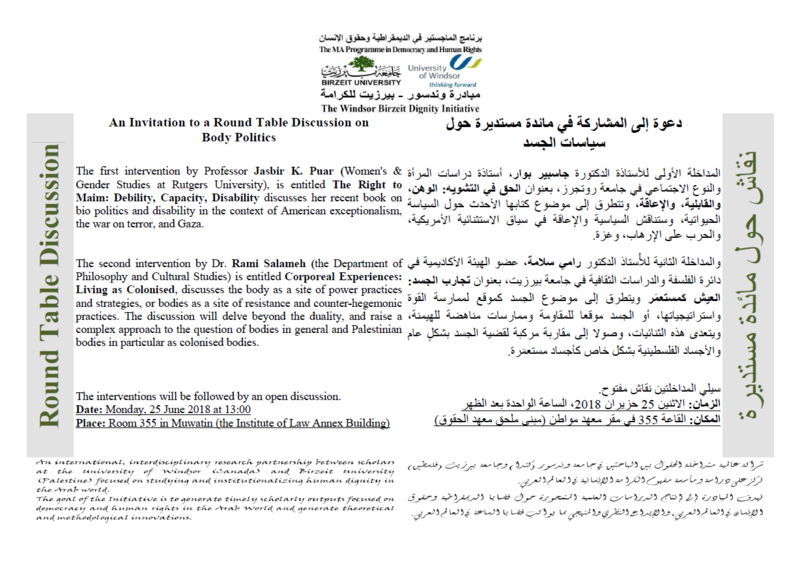 The discussion will delve beyond the duality, and raise a complex approach to the question of bodies in general and Palestinian bodies in particular as colonised bodies. The interventions will be followed by an open discussion.